Alvin Murstein is 81 years old and has a long standing history in the Taxi Industry, as well as financial services. His Father purchased one of the first Taxi Medallions issued in 1937 for $10. His family went on to purchase several hundred medallions, and eventually owned as many as 500 Medallions. When they decided to sell some in the 1970's, no banks would provide the financing, so that's when they decided to get into the lending business. Hence, Medallion Funding Corp. was founded in 1979. His son, Andrew founded Medallion Financial Corp. in 1996, and was established to be the Parent Company of Medallion Funding. Andrew is the President. Mr. Alvin Murstein has been the Chairman of Medallion Financial Corp. since 1995 and has been its Chief Executive Officer since February 1996. Mr. Murstein has also been the Chairman, President and Chief Executive Officer of Medallion Funding Corp. (alternate name Medallion Financial Funding Corp.), a subsidiary of Medallion Financial Corp., since its founding in 1979. 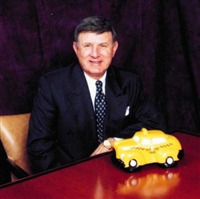 He has been an Executive in the Taxicab industry for over 40 years. He served as the President, Chief Executive Officer and Chairman of Tri-Magna Corporation, the parent corporation of Medallion Funding Corp., from 1989 to May 1996. He has been a Director of Medallion Financial Corp., since its founding in 1995 and Medallion Funding Corp. since 1979. He served on the Board of Directors of The Strober Organization, Inc. from 1988 to 1997. He holds a B.A. and an M.B.A. from New York University. Although Medallion Financial Corp. happens to be the largest source of funding for the Taxi Industry, this segment of their portfolio accounts for only 10% of their earnings.